Election 2019 LIVE: A delegation of Bharatiya Janata Party today filed a complaint with Odisha Electoral Officer, alleging that CM Naveen Patnaik's speech was telecast live while the state went to polls in the first phase. Samajwadi Party chief Akhilesh Yadav today accused the BJP of inciting hatred by "preventing" Dalits from voting. "Preventing Dalit brothers and sisters from casting their votes is not only a sin but also a crime. Crime, because voting is the basic right of every citizen. Sin, because voting ends all the differences between people in a day. But with such a act, the BJP leaders are openly saying that this nation does not belong to everyone. You are creating hatred like this," he said. Clashes broke out between BJP and TMC in Cooch Behar's Dinhata. Similar incidents were reported from Mathabhanga and Natabari. 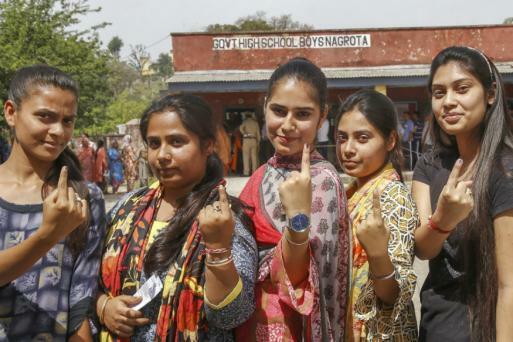 Voters in Noida Claim Inedible Ink on Finger Came Off Soon; EC Says no Merit in Complaints | The Election Commission said Thursday it found no merit in the complaints by a number of voters in Uttar Pradesh's Gautam Buddh Nagar that the inedible ink put on their fingers came off soon after it was applied. The Election Commission officials said they received a complaint from booth number 190, but found no merit in the complaint. A few people had complained that they were able to remove the ink with chemicals like nail-paint remover and others said they were able to wipe it off. Samajwadi Party president Akhilesh Yadav will address a political rally in Pilibhit on Friday. Taking a dig at BJP's 2014 campaign slogan "achhe din aane wale hain" (good days are coming), Samajwadi Party chief Akhilesh Yadav on Thursday said that even the black hole was now visible but the good days is still out of sight. 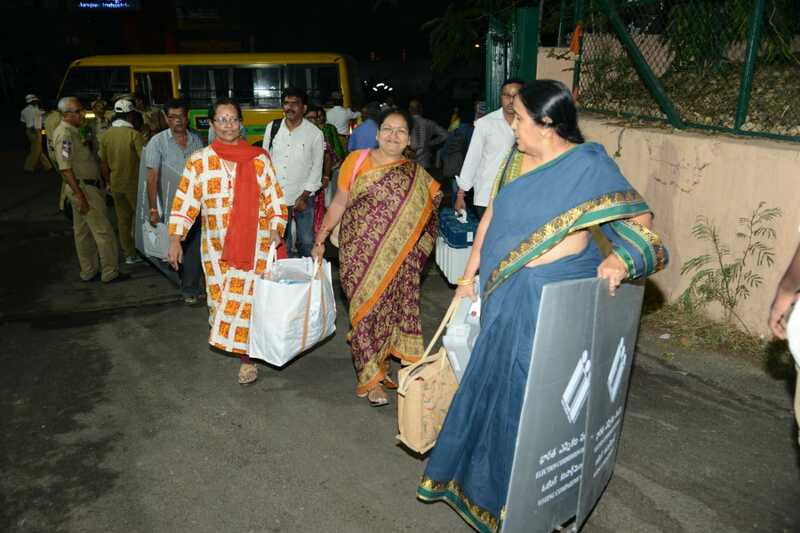 Hyderabad: Poll staff taking EVMs to DRC centers. After alliance talks with Congress fails, AAP ties up with JJP in Haryana on all ten seats. Earlier Kejriwal had proposed a tie up between AAP, JJP and Congress in Haryana. The Congress on Thursday demanded the resignation of Defence Minister Nirmala Sitharaman and Law Minister Ravi Shankar Prasad, accusing them of suppressing facts before the Supreme Court and calling Rafale jet deal documents "stolen". The Congress demand came a day after the apex court agreed to hear review petitions on the Rafale deal on the basis of secret documents leaked to the media. The court also dismissed the government's preliminary objection to treat the sensitive documents as evidence by claiming privilege over them. "The order of the Supreme Court in the Rafale Review Petition case is a huge rebuff to the central government which raised the specious plea of 'stolen documents'. We demand the resignation of the Defence and Law ministers who authorised the plea of 'stolen documents'," senior Congress leader P Chidambaram tweeted. Congress spokesperson Abhishek Manu Singhvi said the two Union ministers "have tried to suppress these documents by calling them stolen and so instructing the law officer to argue before the court." "Does not their act amount to deceit," Singhvi asked. 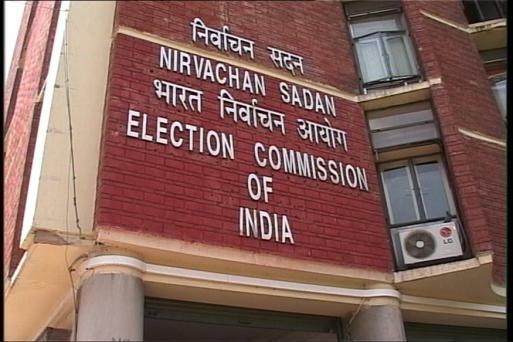 EC Sends Notice to Mayawati | The Election Commission today issued a show cause notice to former Uttar Pradesh chief minister Mayawati for appealing to Muslims to cast their vote against the BJP and for the SP-BSP alliance in Uttar Pradesh. EC Sends Notice to Yogi Adityanath | The Election Commission today issued a show cause notice to Uttar Pradesh Chief Minister Yogi Adityanath for his "Ali" and "Bajrang Bali" remarks while addressing a rally in Meerut. Andhra Pradesh- Polling is still underway in a few constituencies such as Chittoor and Vishakapatnam. Technical glitches in EVMs led to delay in polling process. 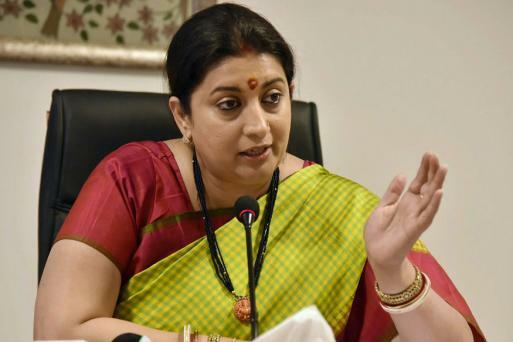 In her poll affidavit, Irani revealed that she undertook her exams for Bachelor of Commerce (B.Com) first year from Delhi University's School of Open Learning, but did not complete the three-year degree course. The BJP Thursday alleged that Trinamool Congress "goons" had instigated violence in West Bengal's Cooch Behar Lok Sabha constituency and did not let people cast their votes. 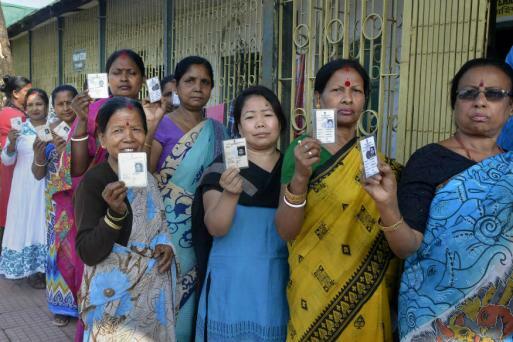 In the first-phase of the general elections on Thursday, polls were held in two Lok Sabha constituencies in the state -- Cooch Behar and Alipurduar. The BJP will approach the Election Commission and will lodge a complaint, senior leader and Union Minister Mukhtar Abbas Naqvi said at a press conference at the party office here. "TMC goons instigated violence in Cooch Behar in West Bengal to interrupt polling and also did not let voters cast their vote," he said. Family members of slain BJP MLA Bheema Mandvi after casting their vote in Dantewada, earlier today. Mandvi had lost his life in a naxal attack in Dantewada on 9th April. BJP delegation files a complaint with chief electoral officer, Odisha alleging violation of Model Code of Conduct by CM Naveen Patnaik. The delegation alleges that his speeches on Thursday were live telecasted on a TV channel. They have requested state CEC to take action. The BJP delegation also alleges that BJD released their election manifesto on April 9, during prohibition period, which was live telecast on TV channels. Chief Electoral Officer, Maharashtra: Polling could not take place at four polling stations of Gadchiroli as the polling teams could not reach there. These are naxal-affected areas. EC will go for re-poll in these four polling stations. Tamil Nadu chief minister K Palaniswami on Thursday accused DMK chief M K Stalin of using intemperate language against him, Prime Minister Narendra Modi and other leaders of the AIADMK-led combine to seek votes. The top AIADMK leader also alleged that DMK men indulged in unruly behaviour and said a leader should seek votes by focusing on his party's achievements during its stint in the government. Stalin, however, was seeking votes by using intemperate language against the PM, CM and leaders of coalition parties wherever he went, Palaniswami alleged. Election Commission on indelible ink: We have received complaint, have asked for a report from DO. The indelible ink goes through lab certification, we have got the certification also, so technically there was no issue. 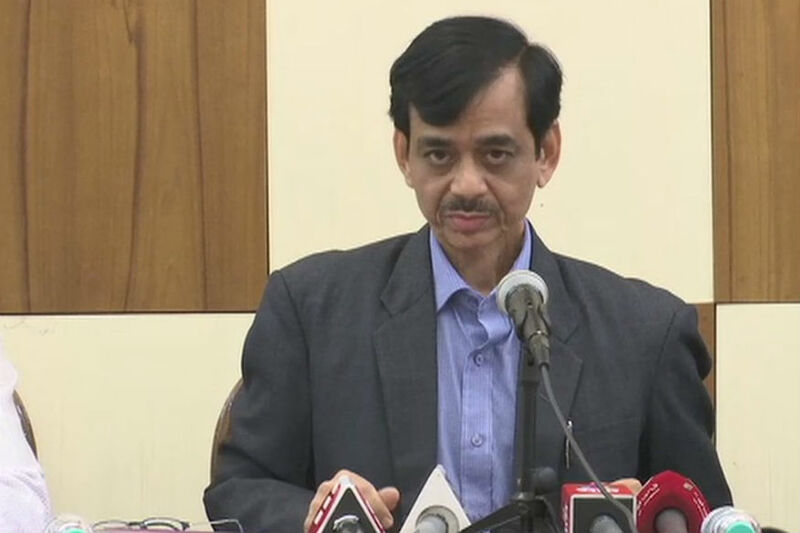 Election Commission: The total seizures in 2019 Election so far, till 6 pm, is Rs 2626 Crore - cash Rs 607 Crore, liquor worth Rs 198 Crore, drug & narcotics worth Rs 1091 Crore, precious metal worth Rs 486 Crore, freebies & other items worth Rs 48 Crore. 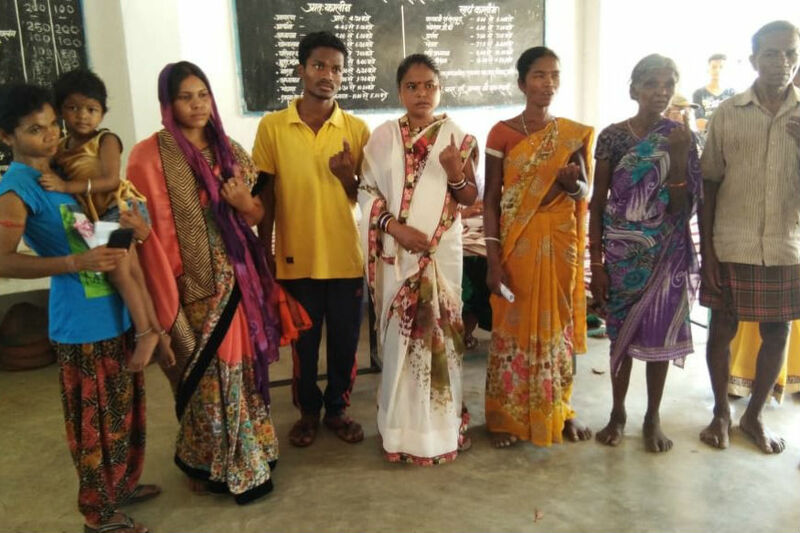 Voters Surprised, Officials Comfortable in 'Pink Booths' | People who voted in the Government Municipality Girls High School in Berhampur on Thursday were in for a pleasant surprise to find only women polling personnel in the booth. 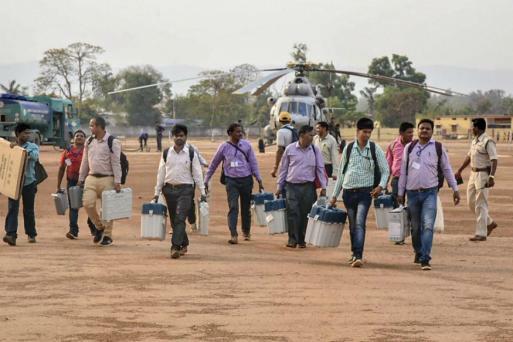 This is one of the five all-woman booths were set up in Odisha's Ganjam district which went to polls on Thursday, a senior officer said here. In the all-woman booths, termed 'Pink booths', all the polling officials were women, though the security personnel were men. "I was surprised to find that all the polling personnel were women... including the presiding officer. I had never experienced that," a woman voter, who refused to be identified, said after exercising her franchise. The Maharashtrawadi Gomantak Party (MGP), an ally of the ruling BJP in Goa, has decided to support the opposition Congress in the Lok Sabha polls in the state. The MGP, Goa's oldest regional party, accused the BJP of "backstabbing" it. The MGP Central Committee, a key decision-making body of the regional outfit, met Thursday and resolved to work for Congress candidates in both the Lok Sabha seats – Girish Chodankar (North Goa) and Francisco Sardinha (South Goa). The BJP has fielded its sitting MPs - Shripad Naik in North Goa and Narendra Sawaikar in South Goa - where voting will take place in a single phase on April 23. Around 700 persons joined the BJP during an hour long Facebook live session hosted by party's Delhi unit chief Manoj Tiwari on Thursday. Tiwari welcomed the new members of the party saying their membership will be formalised within a week. "The Facebook live session that lasted for around an hour reached to over four lakh persons and more than 2,000 persons interacted with the Delhi BJP president. "Around 700 persons became members of the party in this unique digital initiative," said Delhi BJP's social media and media co-incharge Neelkant Bakshi. Tiwari said not only supporters of the BJP but even people of the country were working actively to ensure victory of the party to make Narendra Modi Prime Minister of the country for the second term. BJP president Amit Shah in Bengal says that West Bengal CM Mamata Banerjee’s TMC stands for: T-'Tushtikaran' of Bangladeshi infiltrators, M-Mafia, C-Chit funds scam. Shah went on to allege that Banerjee wants to impose Urdu over Bengali in educational institutions across the West Bengal. He also said that BJP win 23 seats in Bengal. Seeking to woo the Gujjar community, veteran Congress leader Ghulam Nabi Azad on Thursday promised the community exclusive privileges, including free medical treatment, if the Congress is voted to power in the Centre. Azad, who was campaigning for the Congress' Vikramaditya Singh in the Udhampur-Doda Lok Sabha seat, also vowed free education up to Class 12 for students of the Gujjar community in the state. On poll campaign trail for Singh, former Jammu and Kashmir chief minister made the promises while touring various areas like Chatroo and Bunjwah of Chenab valley comprising Doda, Kishtwar and Ramban, having a significant Gujjar population. Gujjars in Jammu and Kashmir happen to be Muslims. UPA chairperson Sonia Gandhi o Thursday declared personal assets worth Rs 11.82 crore, according to the affidavit she submitted while filing her nomination papers here. During the 2014 general elections, she had declared total assets worth Rs 9.28 crore. Gandhi's movable assets stand at Rs 4.29 crore, according to the affidavit. She has given a loan of Rs 5 lakh to her son and Congress president Rahul Gandhi, the affidavit says. She has cash worth Rs 60 lakh and bank deposits of Rs 16.5 lakh. 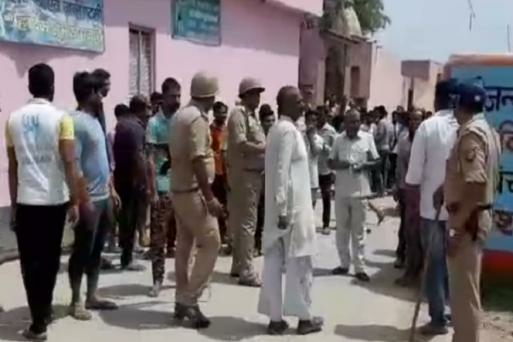 The Bahujan Samaj Party, earlier today, alleged that Dalit voters were being stopped from reaching polling booths by Uttar Pradesh police using force and demanded immediate intervention of the Election Commission. In a statement, the party's national general secretary Satish Chandra Misra said that he has been informed that that BSP voters, especially Dalits, were stopped from reaching polling booths. Prime Minister Narendra Modi on Thursday said that there was a "strong wave" in BJP's favour. Addressing an election rally in Silchar in southern Assam, Modi said, "The people of India have made up their mind. The opposition has no way out. Five seats are going to polls in Assam, the NDA will be victorious in all five. There is a strong wave in favour of us." PM Modi once again vowed to bring the controversial Citizenship (Amendment) Bill during a rally in Assam. Speaking in Silchar, Modi said he was committed to introducing the controversial law that had sparked violent protests in northeastern states two months ago. “The bill will be brought after consultations with all sections; it will be amended in way so as not to impact Assamese people,” he said. BJP chief Amit Shah, meanwhile, asked people in Bengal whether they want to learn Urdu or Bengali as the BJP stepped up campaigning in the state that is crucial for the BJP to return to power. Asserting that May 23 will sound the death knell for Mamata Banerjee, Shah said only Mamata can lead Bengal out of her clutches and end the era of Jungle Raj. UPA chairperson Sonia Gandhi filed her nomination from Rae Bareli, her pocket borough, today with Congress chief Rahul Gandhi and party’s eastern UP incharge Priyanka Gandhi Vadra in tow. Sonia Gandhi, while addressing the media, said one must not forget Atal Bihari Vajpayee in 2004 when talking about the “invincibility” of Prime Minister Narendra Modi. Prime Minister Narendra Modi today lashed out at the Opposition, saying the 'Mahamilavati' gang was scared that if he returns to power, their shops of corruption and dynastic politics will be shut down. Modi, who was addressing a rally in Bihar, said while voters were happy with the action taken against Pakistan, the Opposition was trying to "tie the hands" of armed forces. Modi will later head to Mangaldoi and Silchar in Assam for public meetings. BJP chief Amit Shah will battle it out with West Bengal Chief Minister Mamata Banerjee on her home turf. 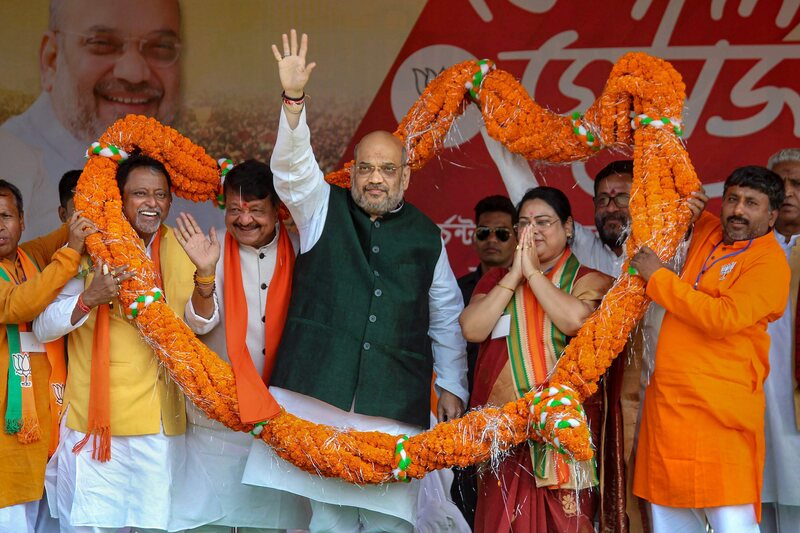 Shah will address public meetings in Raiganj and Kalimpong while Banerjee will be in Kalimpong. Union minister Smriti Irani held a grand road show before filing file her nomination in Amethi. Irani has been wooing voters in Amethi, the pocket borough of the Gandhi family, by taking potshots at Rahul Gandhi for contesting from Kerala’s Wayanad as a second seat. Uttar Pradesh Chief Minister Yogi Adityanath participated in a road show in Irani’s support and also addressed a rally. The hectic campaigning comes on a day when 91 seats across 20 states are voting to choose their representatives. 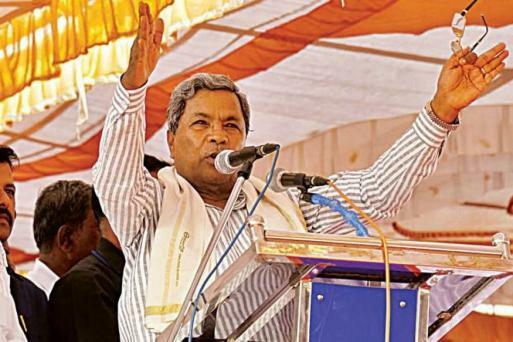 Among the big names in the fray are Union ministers Nitin Gadkari, Kiren Rijiju and VK Singh. Voters in Andhra Pradesh, Sikkim and Odisha will be voting in two elections with the Assembly polls in these states being held simultaneously along with the Lok Sabha elections. Polling is being held in all Lok Sabha constituencies of Andhra Pradesh (25), Telangana (17), Uttarakhand (5), Meghalaya (2) and Arunachal Pradesh (2) besides lone seats in Mizoram, Tripura, Manipur, Nagaland, Sikkim, Andaman and Nicobar, and Lakshadweep. Eight seats in Uttar Pradesh, seven in Maharashtra, six in Bihar, five in Assam, four in Odisha, two each in Jammu and Kashmir and West Bengal and one seat in Chhattisgarh are also going to polls.